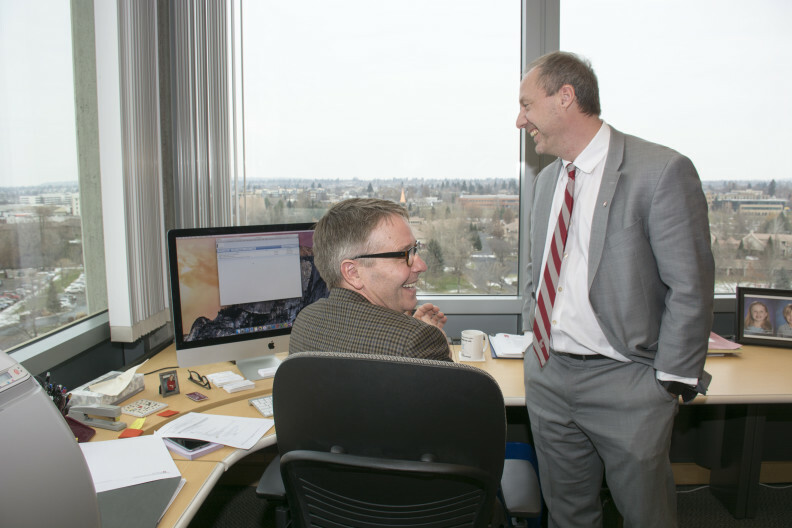 Vice Dean Ken Roberts and Founding Dean John Tomkowiak celebrate today after electronically sending the WSU College of Medicine accreditation application documents to the accrediting agency. One more big step toward creating the medical school part of the WSU Elson S. Floyd College of Medicine has been taken. After months of research, writing and editing, as well as four community meetings in Spokane, Richland, Vancouver and Everett, the process of sending WSU’s application for medical school accreditation was surprisingly low key. Vice Dean for Academic and Community Partnerships Ken Roberts sat at the computer in his office, joined by Founding Dean John Tomkowiak, sent three files, totaling more than 750 pages, to the Liaison Committee on Medical Education, or LCME, the national accrediting agency for medical schools in the U.S. The process took just a few minutes. No champagne bottles were uncorked, although that may come later. “This is a momentous occasion and the culmination of the efforts of many individuals from the college, the university and the community,” said Founding Dean John Tomkowiak. The 228-page “data collection instrument” and 40-page self study document – along with more than 500 pages of appendices — outline how the new school will address a dozen standards created by the LCME, including the structure of the medical school, how it will be funded and the curriculum that students will be taught. The LCME could consider the application at a meeting in February 2016. If all is in order, the next step will be a site visit. “Today is another exciting step forward in making the Elson S. Floyd College of Medicine become a reality,” Tomkowiak said. One other note: The College of Medicine is pleased to announce two new employees have joined the college today. Yvette Roubideaux, MD, MPH, is the college’s new associate dean for diversity, inclusion and leadership. MaryAnn Clemens, EdD, FACHE, will serve as special advisor to the dean for curriculum development.